United States Air Service (USAS), First Aero Squadron. April 2nd, 1918, near the Toul Sector in occupied France. As heavy clouds part, Lt. William G. Schauffler (Pilot), and Captain Thomas J. Griffin (Observer) side-slip their SPAD XI to avoid intense ground-fire coming from the town below. Schauffler and Griffin have the "unofficial" honor on this day of being the first American officers to cross over German lines on the Western Front. What had begun as a routine camera test-flight near Toul, France, took a deadly turn when they encountered low clouds and fog near the front-line trenches. 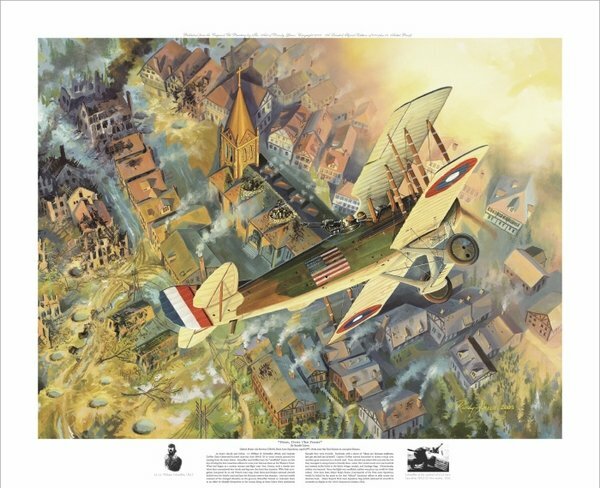 With their navigation hampered by an old French road map, their Stars-andipes adorned aircraft drifted over No-Man’s Land and into the German reserve-line airspace. Lost and totally unaware of the changed situation on the ground, Schauffler buzzed an unknown town in an effort to identify themselves to the troops firing at them below (they mistakenly thought they were French). Suddenly, with a shout of "Those are German uniforms, get the hell out of here! ", Captain Griffin alerted Schauffler to enemy troops with machine guns mounted on a church roof. Their aircraft was raked with accurate fire but they managed to escape back to friendly lines. Later, they would count over one hundred and seventy bullet holes in the fabric wings, cockpit, and fuselage flags. Miraculously, neither was harmed, but since the flight into enemy territory wasn't authorized, they weren't given any credit for their ordeal.